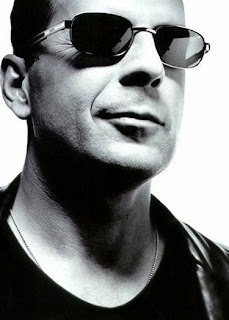 In 2001, he swore blind that he'd never again appear in an all-action, explosions-a-go-go blockbuster, but Bruce Willis had a hard time escaping his reputation as that genre's most successful star. Indeed, since his first major cinematic hit, Die Hard, many of us cannot witness a fiery onscreen detonation without imagining Bruce - wide-eyed and panting in a grubby white vest - flying through the air, arms and legs flailing frantically. He's just too damn good at it. But, of course - being both a singing star, a restaurateur and an arch comedian - there's been far more to his career than that. Bruce Willis was born Walter Bruce Willison on the 19th of March, 1955 in Idar-Oberstein, a German town near the border with Luxembourg. His dad, David, being a military man, was stationed there and his wife, Marlene, was from Kassel (they'd be divorced in 1971). On his discharge in 1957, David took his family back to Carney's Point, New Jersey, finding employment as a welder and a factory worker. Bruce, the oldest of four children (he has a sister, Flo, and two brothers, one of whom, David, is a movie producer), attended high school at Penn's Grove. A popular fellow, he was elected Student Council President and, strangely for a boy of such resolute blue-collar pride, threw himself into drama classes. This was perhaps because, tormented by a debilitating stutter, he discovered that he lost his impediment when onstage. He was also a talented wrestler - that scar on his shoulder now is actually the result of a serious sprain. Though a good student, he was suspended for three months in his senior year for taking part in what he later described as "the annual riot". Upon leaving school, Bruce (nicknamed Bruno) was expected to attend college but, keen to live as a normal working-man, he instead took a job transporting work crews at the Du Pont factory in nearby Deepwaters. This continued until a fellow driver was killed on the job, and Bruce quit, later becoming a security guard at a nuclear plant under construction. Already keen on music, and kicking back in general, he hung out in bars and played harmonica in R&B band Loose Goose. Yet, despite his desire to be "regular", he discovered that he missed acting and enrolled at Montclair State College, where he leapt enthusiastically back into drama classes, causing something of a stir with his performance in Cat On A Hot Tin Roof. Eager to forge a career, he'd skip classes to attend auditions in New York City - eventually dropping out altogether and taking an apartment in Hell's Kitchen, much closer to the action. He would for some months share his lowly abode with another aspiring actor, Linda Fiorentino.